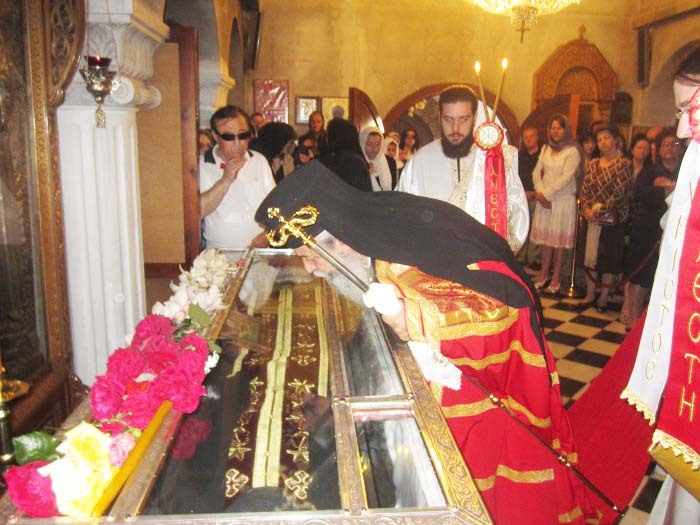 St. Ephraim of Nea Makri believed to have lived from 1384 to 1426. 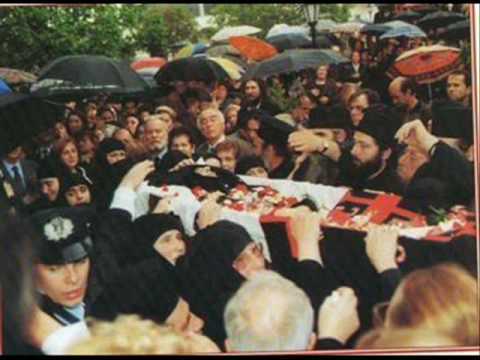 The local bishop kiss the coffin with the dressed up remains of Ephraim. Exhumed from his grave, 500 years after his death. Ephraim is venerated as a martyr and miracle-working saint by many Greek Orthodox Christians in Greece. His status as a saint is controversial, as there are no sources testifying to his existence as an historical person, living 20 kilometers east if Athens. 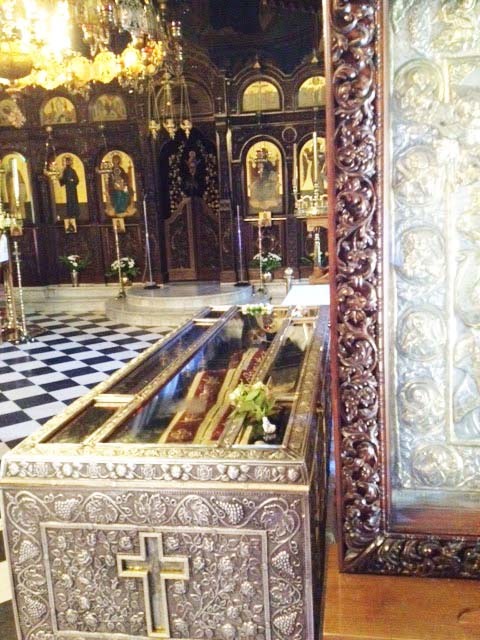 In the shrine of Ephraim the priests use Christian symbols, claiming to be servants of God. 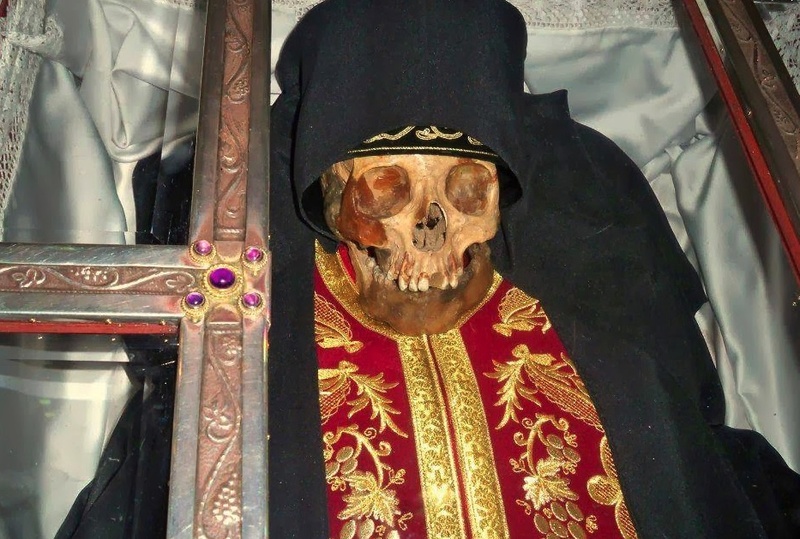 The religious people of this village in Greece parade the skull and skeleton in public. Believers regard him as a “newly revealed” saint, whose existence is a matter of divine revelation rather than historical proof. The relics of Saint Ephraim were discovered through divine revelation in 1950 … 524 years after his death. Abbess Makaria….After some time, she seemed to sense an inner voice telling her to dig in a certain spot. She indicated the place to a workman whom she had hired to make repairs at the old monastery. In the ruins of an old cell, he cleared away the rubble and began to dig in an angry manner. The abbess told him to slow down, for she did not want him to damage the body that she expected to find there. He mocked her because she expected to find the relics of a saint. When he reached the depth of six feet, however, he unearthed the head of the man of God. At that moment an ineffable fragrance filled the air. The workman turned pale and was unable to speak. Mother Makaria told him to go and leave her there by herself. She knelt and reverently kissed the body. The demonic onslaught on Earth continue. Like this Greek nun, who receive and transmit messages from unclean spirits. In stead of worshipping the living God, religious people reduce them selves to puppets of Satan. You have to be filled with the spirit from the abyss, to dress up a skeleton and a corpse, with priestly garments. Its repulsive. And it is utter blasphemy against the scriptures. Jesus the Messiah told us that the walking dead should go and bury their own dead. He also warned us not to listen to blind guides. When a blind person leads another blind being, they will both fall in a ditch. Thanks for this comment. It will keep me on the blog. I will continue to expose the Catholic worshoip of death, skulls, bones and corpses. This is not a local issue among alledged apostate Catholics in Peru. Italy and the Vatican state is the epic center of this kind of religios blasphemy against God of the Bible. I know it’s been a while since this article was published. Many dogmas don’t believe in saints. Many dogmas of Christianity also don’t believe in Marry as she was human and not God, even tho she gave birth to Jesus. However, Orthodox Christians (and other Christians) don’t believe in them as Gods neither do they pray at them like Gods. The aim of every Christian is to become a saint; that is to be worthy by leaving a peaceful life and praising God. When people are “attracted” to saints, it’s not because they see them as gods or wizards but rather as examples on how to leave properly in the name of Jesus Christ. Their lives can teach us the true meaning of love, forgiveness etc. A good example to illustrate this is a candle. For a candle to be useful it needs to be lighted. However, when that happens the darkness goes away and whoever leaves in the darkness can now see. Now that’s not the candle that does that but the fire. Without the fore the candle is useless. Imagine we are the candles, when we reach a high spiritual level our candle is lighted with Jesus Christ. And it’s this light, Jesus, who through us people can see the light. We glorify the saints because God does. Lastly, the use of holy relics can be found in the old testament (2 Kings 13:21) where a dead body touched the body of Elisha the prophet and the man rises. @SK99 well-said! As Orthodox, we venerate the saints, but worship God because worship belongs to Him and to Him alone. The saints are shining examples of what it means to be a Christian. People who proclaim to be a Christian can learn a lot by their example if they are willing to take the time. And in order to do that, they must not put their trust in worldly logic; after all, God is not of this world. The saints understood that, thus, as Christians, we should learn by their example.